Motor: Baldor 7.5 hp Electric, 230/3 phase, 36' power cord w/GFCI. 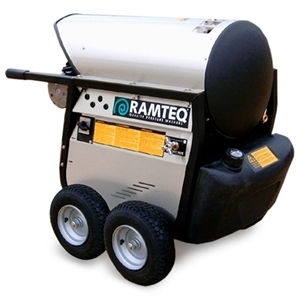 Oil Fired Burner: Beckett 120 Volt burner system, Diesel fuel filter, 9 Gallon fuel tank. Frame: Portable, Steel powder coated frame, w/ Stainless steel coil wrap and Stainless steel closeout panels, Pneumatic tires (4). Standard Features: Adjustable thermostat, 50' Hi-pressure Hose w/quick connect fittings, 36" Lance & Trigger, One (15*) spray Nozzle, Down-Stream Soap Injector w/soap nozzle, Pressure Relief Valve.